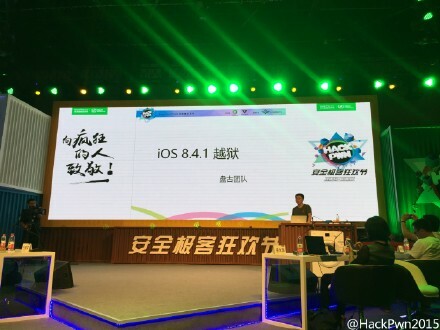 Team Pangu showcases iOS 8.4.1 jailbreak, release imminent? With the release of iOS 8.4.1 Apple killed the TaiG jailbreak. It hasn’t been long since the minor iOS update has been out and it seems like team Pangu has already jailbroken it. The Chinese hacker team showed a working iOS 8.4.1 jailbreak running on iPhone 6. The jailbreak was shown publicly at the HackPwn2015 security conference. Team Pangu took it to Chinese social networking site Weibo to share more details about the hack. This demonstration by team Pangu has established that iOS 8.4.1 is indeed jailbreakable, however whether they will end up releasing Pangu8 with iOS 8.4.1 is a question that remains to be answered. This is a tricky question too, as with iOS 9 less than a month away hackers might want to restrain themselves from another release, as it could help Apple in closing exploits in the upcoming iOS 9 software release. So will Pangu release an iOS 8.4.1 jailbreak before iOS 9’s release or will they simply focus on the newer version to be released next month. We will have to wait to find that out.